Your project will go smoothly if you begin with the proper materials. To calculate the materials required, begin by sketching out your wall including dimensions for length and height. Also take into consideration any critical conditions that may influence your wall’s geometry. Use the illustrations here as a guide to sketch out your wall. You may also want to review your sketch and measurements with your local Authorized Dealer to ensure that your estimate is as accurate as possible. Here is a sample wall profile. If your wall height varies, divide the wall panels into segments according to height. This will assist in effectively calculating the square footage, as well as eliminate excess materials. (See the Front View, Side View, and Overhead view drawings below). Enter Wall Length (WL) and Wall Height to determine the quantity of cap units and stacking wall units needed for your project. Total Wall Length will determine quantity of cap units. Total Square Feet of Face (SFF) will determine quantity of stacking wall units. Terraces are a pleasing way to build a taller retaining wall. Closely spaced terraces need to be reviewed by a qualified engineer to determine overall stability. Terraced walls should be analyzed as a complete wall system versus an individual wall, unless they are spread greater than twice the wall height of the lower or first wall and the soils are free draining and granular in nature. The load imposed on the soil behind the wall which exerts an additional force on the wall structure. 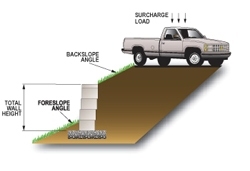 The angle from the top of your wall to the top of your slope at the finished grade. The angle from the bottom of your wall, not including embedment, to the finished grade. 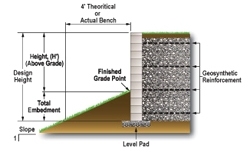 The presence of water is a significant factor in designing segmented retaining walls. Using your dimensions determine your square feet of face area by multiplying the wall length by the wall height. 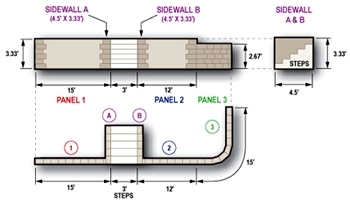 Remember to panelize your wall if your project has varying wall heights. Once you have a total SFF area you can estimate the total number of block you will need. The number of caps required can be determined by the overall length of the wall. Use the "How To" information on the Rear Lip, Pinned System or Country Manor & Stonegate County Manor pages, to complete a preliminary product estimate. After you have completed your sketch, and selected a product type, take your measurements to your local Authorized Dealer. They can assist you in preparing a final product estimate for your project. Additionally most Authorized Dealers have displays at their yard to assist you with product and color.